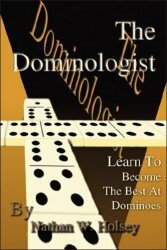 The Dominologist: Learn To Become The Best At Dominoes is a new book by Nathan Holsey. The book is about Double Six Dominoes, the most commonly-played domino game in the U.S. Now the novice will be able to compete with the experienced player. Benefit from the author’s 30 + years of experience. Learn to talk trash like you have been playing for years. The Dominologist is the first of it’s kind. If you ever wanted to join in a on a game of Dominoes but chose not to because of your confidence level, stand on the side lines no more. Get in with the big boys. No one will ever know that you just started playing Dominoes. You’re getting all the experience you need to play Double Six Dominoes from The Dominologist. The Dominologist is not just for the novice, advanced players will enjoy the content provided as well. The Dominologist will help you to continually think out your hand for the best result. This book will help you confirm your greatness or define your muscle. It’s for teens and Adults of all ages. Based on the most common game played in the US. Now the novice will be able to compete with the experienced player. Get the best strategy and build your confidence level. Get over 30 years of experience and learn to play and sound like you have been playing for years. This book is the first of its kind. There are pictures and diagrams to help you remember plays and combinations. It will also help you to quickly add and call your points. You will learn to understand the game of Double Six Dominoes at its best. Winning will become easy. Nathan Holsey was born in Hawaii and raised in Long Beach, California. He learned to play Dominoes over 30 years ago. He has competed and placed in the top ten of the First California State Domino Championship, and competed in the Professional Domino Associations’ Los Angeles Regional Domino Tournament. His love for Dominoes inspired him to write the book and start his own publishing company, BIG SIX Publishing. He and his wife now run their own TV and Film production company, Avielle Productions. You can learn more at the author’s web site: TheDominologist.com.